There are certain bands that gain popularity after they’re gone. I’m going to say Craig’s Brother is one of those bands that has gained cult status since their departure from Tooth and Nail and their break-up. Lost at Sea is a christian punk classic. So Craig’s Brother is back with the Insidious Lie. And I’m going to dub it their best work yet. An updated version of the band’s pop punk stylings. Right out of the gate, Freedom kicks in with a catchy hook, and an infectious pop punk sound that hooks you. 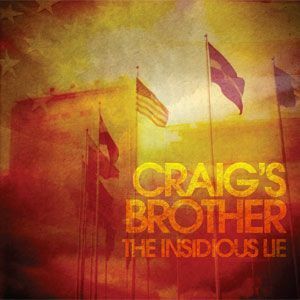 Thousand Yard Stare, Adaline, and The Problem of Evil are some of catchiest and best Craig’s Brother songs ever while Mistake of Caring, Insidious Lie, Party Girl, and Closure are all solid pop punk tracks. It’s nothing new but it’s pop punk done so well that I would argue it doesn’t need to be new. The Insidious Lie is so infectious from the start and doesn’t let up that I couldn’t help but like the album. While there are only a handful of what I’d label as standout tracks (Freedom, Thousand Yard Stare, The Problem with Evil), there aren’t any bad songs on the record. The Insidious Lie is pop punk goodness. Another great record from Craig’s Brother.